DVD Blu Ray Japanese Release: May 17, 2017. (no date announced at time of this blog post for an English DVD / Blu Ray Release). Geeky: 4/5 Gorgeously animated and very true to the original story within the manga. It does lack action and move at a sometimes slow pace and deals with heavy and unpleasant themes at times. Sweetie: 5/5 The transformation of the characters and values of friendship, love, redemption, and need for connection, are all highlighted in a tale that shows the coming of age of a group of adolescents. 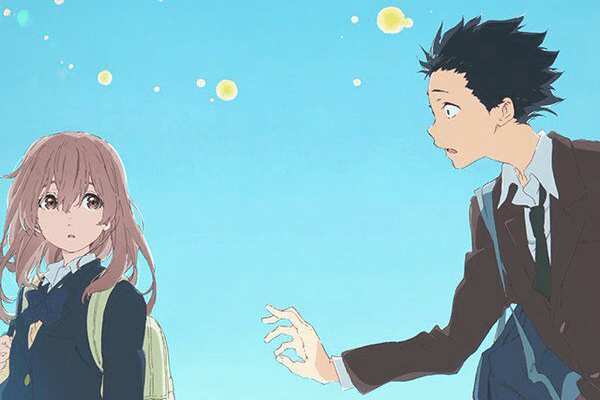 Story: 9/10 Koe no Katachi is a coming of age story wherein we witness the growth and life changes which shape and change the nature of relationships between a group of friends, enemies, and lovers. 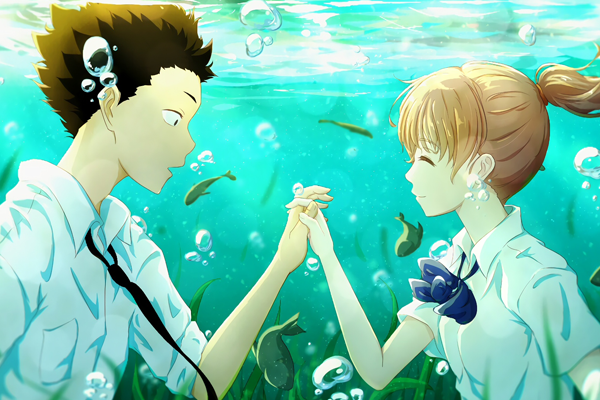 The story centers heavily around 2 youths, Ishida Shoya and Nashimiya Shoko, and their classmates. When the film starts, they are in elementary school, and by time the film ends they are seniors in high school. 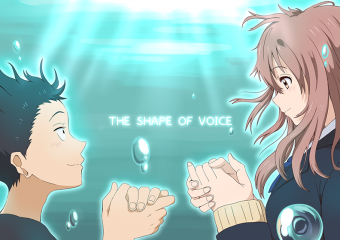 Shoko is a deaf student who transfers in to the class. Shoko is the only student with a disability, and none of the staff, students, or teachers are prepared or equipped to deal with her. As a result, Shoko becomes the victim of bullying, with Shoya largely being the ring leader behind her tormenting. 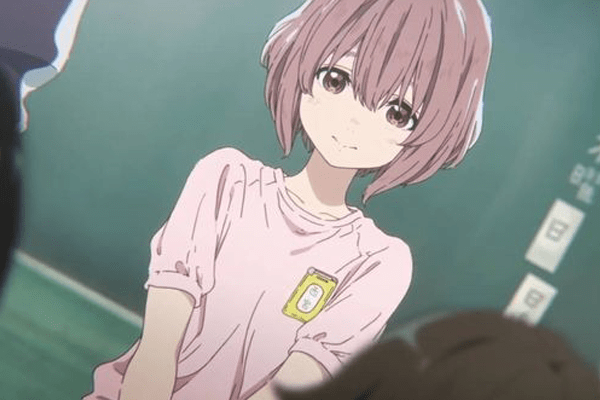 When it is discovered that Shoko has been bullied by her classmates, the other students and staff all blame Shoya which results in then his being bullied. The bullying continues throughout highschool as well, leaving Shoya with zero friends, and afraid to get close to anyone. Shoya even considers committing suicide to escape the bullying. 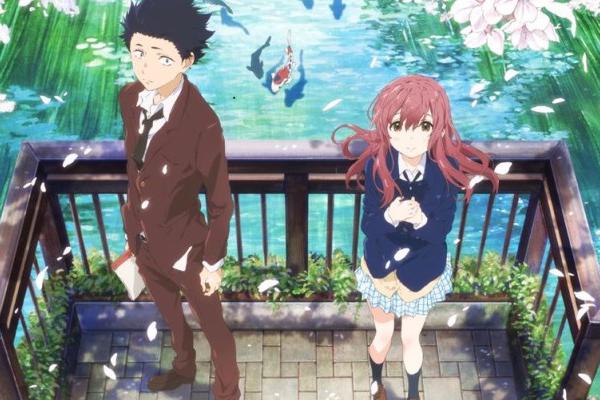 He runs into Shoko in his senior year of high school and immediately begins a plan to befriend her, having felt guilty for bullying her when they were younger. Shoya has been studying sign language and is now able to easily communicate with Shoko. He asks if they could be friends, the same thing she asked of him when they were little. Shoko has grown stronger and has many friends already, but she blames herself for breaking up Shoya’s group of friends and for Shoya’s years of being a victim of bullying. The two forge an unlikely friendship, both hating and blaming themselves for their past interactions. Shoya has grown and matured, and not just out of his feelings of guilt towards Shoko. Early in the film he befriends a male classmate who is also being bullied. This leads to Shoya’s first friend since elementary school. Even Shoko’s sister who is very over protective of her, comes to accept Shoya when she realizes how much he has changed, and encourages him to date Shoko. 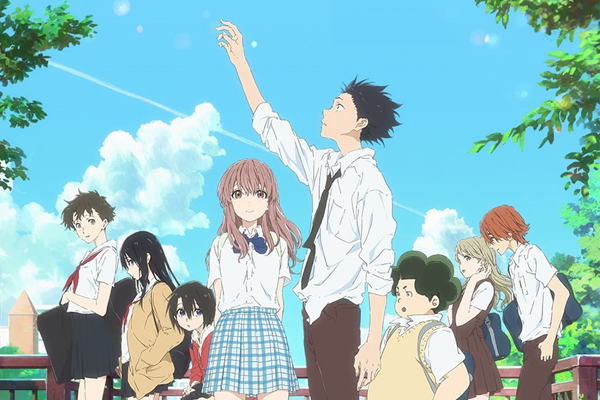 Shoko wants to help repair the friendships of Shoya’s childhood friends so she begins gathering the other students, some of which still resent Shoko and Shoya. There’s even a bit of a love triangle when Shoya runs into an old classmate, Ueno, working at a cat cafe. It is a touching and moving story. School bullying is a huge problem in both Japan, as well as North America, and it does often lead to an increase in child and teen suicide. Therefore, these themes and characters feel real, raw, relateable, and brimming with emotions. The manga goes a little bit further than the anime by showing what happens after high school to most of the friends in this story. However, the movie is a faithful adaptation of the manga given the time constraints of the format (taking several volumes of manga and condensing down into a 2 hour film). Characters: 7/10: It can be difficult to watch a show as “heavy” as this at times. Almost of the characters are bullies and/or the victim of bullying. The main character and his friends are not “nice”. Even after they mature, many of the characters remain self-interested and shallow. 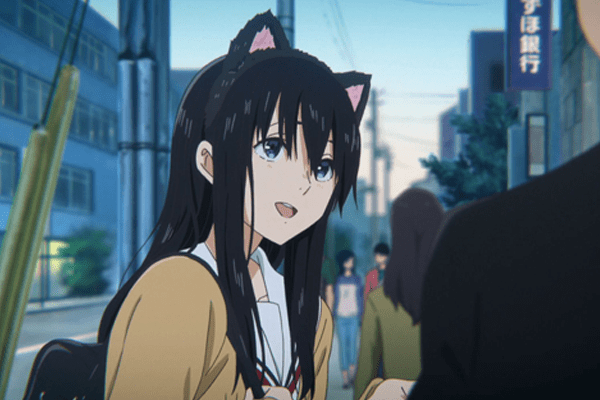 However, seeing Shoya’s transformation, and character development throughout the film from a bully to being bullied, and then to finding love and friendship is really the highlight of the film. Well that, and just how cute and unique of a character Shoko is. It does a good job of showing both the home life, school life, and recreational life of the group of friends. Even the minor characters, such as Shoko’s sister and grandmother are well fleshed out. Art: 10/10 – the anime is gorgeous to look at, especially some of the lovely backgrounds such as the koi pond, fireworks festival, or starlit skies. 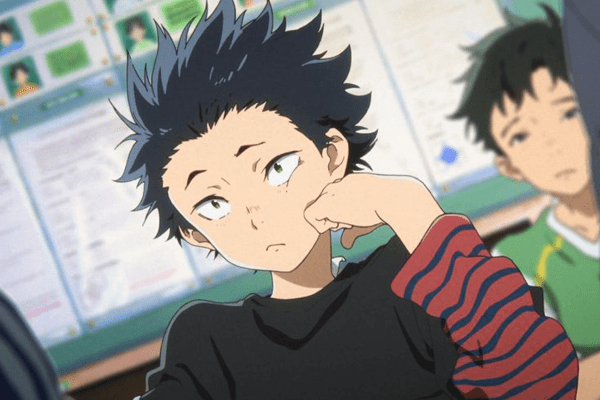 The character designs are cute and distinctive, from Shoko’s utter adorableness, to Shoya’s unkempt “I don’t care” attitude (messy hair, tag always sticking out of his collar, etc). Even the supporting cast has unique well defined designs, from their height, weight, hair, or fashion, all making them more memorable. But perhaps the most interesting thing here is that they have actually animated some sign language scenes between the characters. Unfortunately I don’t sign, so I can’t comment how accurate the animations were, but it was still an interesting touch none the less. Music: 4/10: I felt the music was very hit or miss for me. The opening theme song is an old (70s or 80s I think) American rock n roll song, which isn’t to my taste and didn’t seem to fit the theme or characters. The other music was not very memorable. Voice Acting: 9/10: I dunno if Shoko’s voice actress is actually deaf or suffering from hearing loss, but the actress definitely has a speech impediment – whether that is real, or fake, I can’t tell. Other films and TV series, such as Switched at Birth have used deaf actors and actresses before. If she is not deaf, then that’s even a higher testament to her acting ability since she is able to keep the speech impediment consistently throughout the film. This does make her hard to understand at times. The version I watched was likely fan subbed and not the official translation. The writers tried to characterize Shoko’s speech impediment even in the subtitles, and at times, I found myself feeling as frustrated and confused as the other characters trying to understand what she was saying lol. She still sounds cute, and her speech impediment plays an important part in the story. The other characters are equally as well cast and really bring the characters from the manga to life on the big screen.